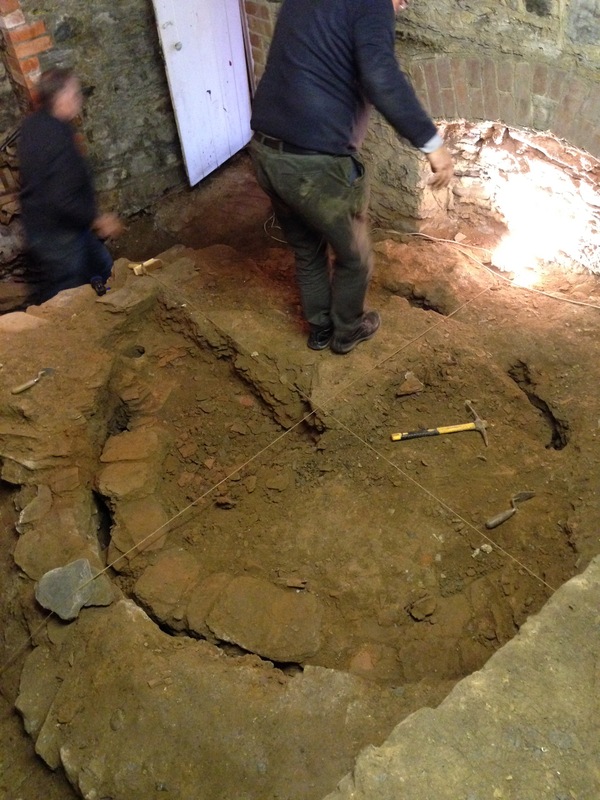 Work on the Memorial Hall in Newport, near Fishguard in Pembrokeshire has moved on another stage as we have been able to begin re-excavating and recording the medieval kiln in the basement. Having got the appropriate permissions, the aim has been to clear away 95 years of dust and debris and reveal the top of the kiln, its flues and floor. This will then allow the next stage of conservation and preservation to proceed. 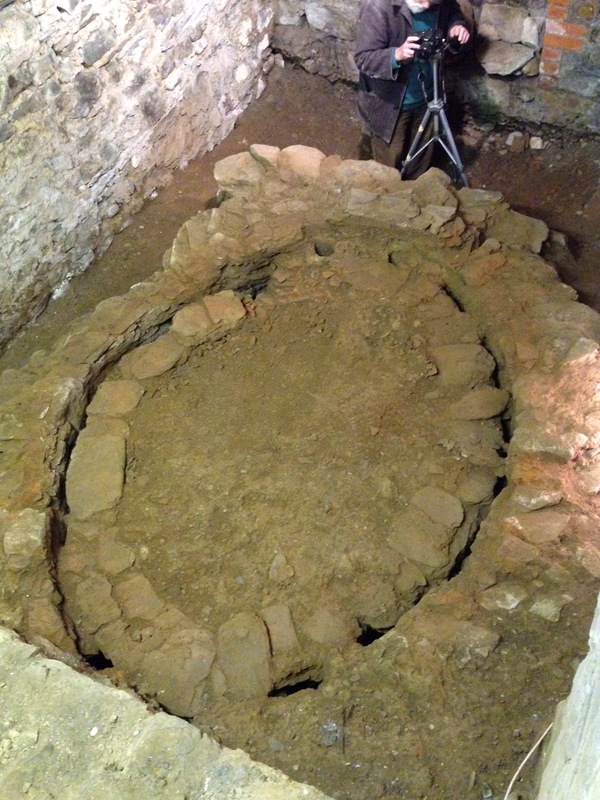 As I explained earlier ((The Medieval Kiln at Newport, Pembrokeshire, posted 7 Feb 2016), two kilns were found in 1920 during the construction of the hall and after examination and recording by Sir Mortimer Wheeler, one was preserved under the floor of the stage. Wheeler published a plan and elevation in 1923 which showed the complete firebox, underfloor flue structure and warechamber floor of a round single-firebox kiln. Current dating would be late 15th or early 16th century. The preserved kiln was scheduled as an ancient monument but became more or less forgotten despite the republication of Wheeler’s drawing in the 1970s. It has only been with the current project to renovate the hall that the kiln and its history has resurfaced. The Hall Committee and local people have been keen to celebrate the kiln and their own history and make it better known. A team of specialists including David Dawson and myself have begun to help them achieve that. As it stands before we work on it the kiln consists of a clearly visible firebox and a central plinth supporting a flat area with a few punctures in an arc to one side. This seemed likely to be the kiln floor with some of its flues rising from the large ones visible beyond the firebox below. A survey by Karen Slade suggested that the flue structure was closed off about half way across the area and that a small opening at the rear seemed to indicate a second set of flues and by implication a second firebox hidden under the unexcavated area of the basement and a light cross wall. Initial clearing of the north side revealed a triangular pit containing rubble, blue and white China, a clay-pipe stem and a leather boot sole. It bottomed out where it hit big chunks of slate and the inner face of the plinth. 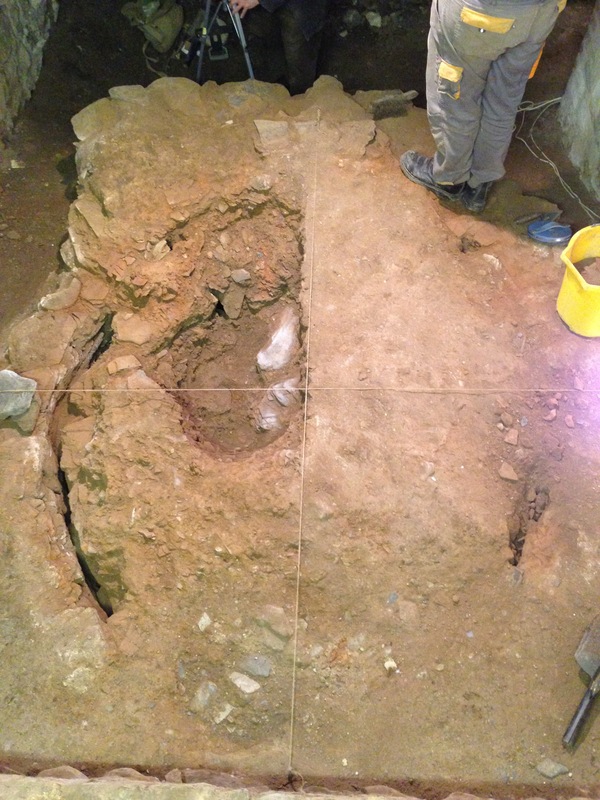 Tidied up, it had a flat face on the centre line of the firebox and therefore appeared to be an attempt to cross-section the interior of the kiln by archaeologists. The surprise beyond it was that the rest of the top seemed to be hard packed and devoid of modern artefacts as if the excavation had progressed no further. The exception being the openings into the flues on the north side (where Bill is poking his selfie-stick) and a small one on the south. As the north side was exposed the flues began to be revealed. The hard packed material in the centre seemed to overlie flat slate slabs leaving a narrow channel supported by the corbelling and bars below. The selfie-stick quickly confirmed that the second firebox was present (under the cross-wall and the photographer’s feet). The centre of the kiln looked worryingly empty but the biggest surprise was the arc of the kiln wall which suggested an oval kiln rather than a round one. It seemed that Mortimer Wheeler’s drawing was a very crude thumbnail tidied up for publication. Trowelling revealed the slate rim of the floor and the flue channel and openings but the inner floor was elusive. The elyptical shape of the kiln became more evident, pushing further back and disappearing below the shallow cross-wall. Also more apparent was the thickness of the kiln walls – the narrow areas either side of the firebox seem to be the result of the intrusion of the foundation trenches for the hall above. Odd things began to appear above the firebox. This is the point we decided to stop. 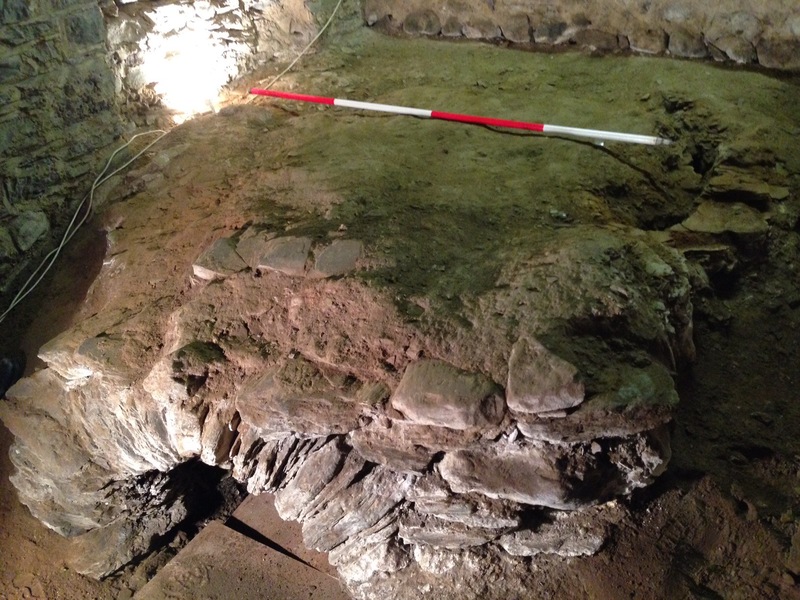 The kiln chamber is 2m x 2.5m, its floor corbelled out from a central slate and rubble drum. The two fireboxes (one invisible but complete and empty of debris) feed two u-shaped flues closed off from each other that open into the chamber through holes around the edge of the floor. The floor proper is missing except around the excavated firebox. Here it consists of fired compacted clay and two of the flue openings are shaped from modelled clay (there is another modelled vent at the other end). This indicates that the upper levels of external stonework are the lowest part of the ware-chamber. The notch in the wall and the large slabs above the firebox are interesting. There are various thoughts growing out of this. The kiln is much bigger than the Mortimer Wheeler report suggested and although structurally similar, very different. 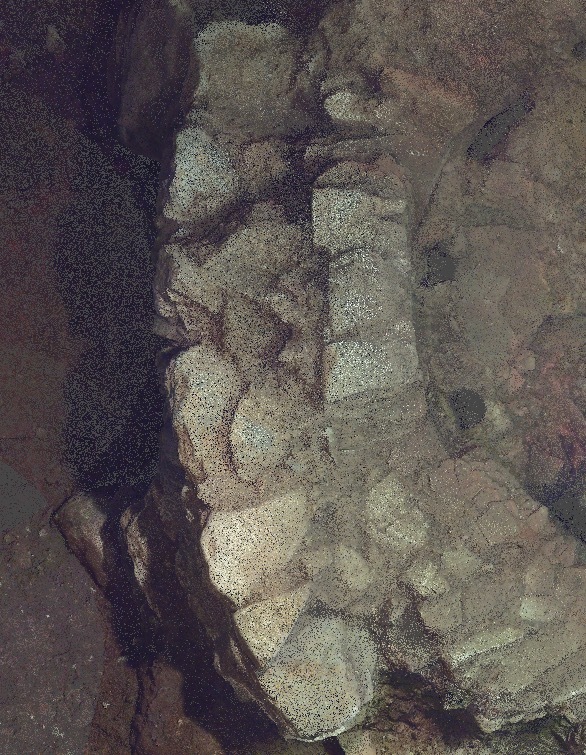 It seems to have received only brief archaeological attention in 1921 and the most plausible conclusion has to be that this is not the kiln recorded by Wheeler but the second unrecorded one. 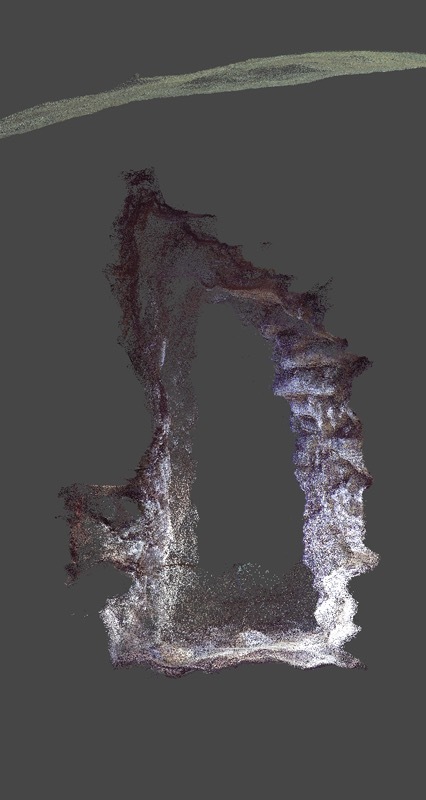 The whole structure is being laser scanned as we go along by Bill Stebbing (Scan to Plan). Below are some screen-shots. The first shows the area above the west firebox and the fired clay flues and floor. The other is a cross-section of the main flue showing the central drum corbelled out towards the outer wall to support the floor. For more go to Pembrokeshire Kiln on YouTube. This entry was posted in Archaeology, Architecture, Experimental Archaeology, Kilns and Kiln-building and tagged ceramics, excavation, history, medieval, Newport Pembrokeshire, Pembrokeshire, pottery, Wales, Welsh archaeology. Bookmark the permalink.